For news and magazine production 2, me and my group, Mika, Maria, Emily and Swee Lee will be creating an online magazine based on positivity. We chose positivity because we felt there are not many positivity magazines on the market, and it would be something interesting to create. We first started to make a flatplan, where we use a grid to fill out what each of us will be writing, and where it will be seen inside the magazine. As each of us have to write a number of features, reviews and news articles each, we weren’t stuck for ideas. I chose to write about relationships and depression, and exercise, as I feel I have a lot of experience with both. The others chose their suited subjects and we filled them into out flatplan. We then had to think up of a name for the online magazine. 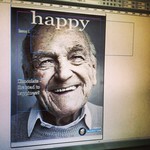 “Happy” seemed to be the favourite title, however I still think the title needs to be overhauled. Personally I think the word “positive” in a different language would look cool, as our group is pretty international. We then started to design a mock front cover on InDesign. As none of us are brilliant at InDesign, we had a shaky start, however after playing around with it, it came along pretty easily. We looked for images of smiling old people on google, as we wanted it to be an emotion bringing front cover that will draw people in. We found the above image and thought it was really heartwarming – an old man smiling and laughing and looking up. We wanted an older people because Mika may write about an old person, and wrinkles and age tells a story. We fitted the image on the document, and then fitted the headlines around the image in a white font. We used white because it was clean looking and it matched the old mans hair, teeth and collar really well and brought everything together. It looked really professional! Next session we will be finishing the front cover, and moving on to the contents page.